At Skinnovation we use a medical grade laser; MedLite C6 Q- Switched laser, which is considered the Gold Standard of laser tattoo removal machines in the market. The laser works by targeting the ink or pigment in the tattoo and shattering the ink particles into micro particles,that will be naturally eliminated by the body’s immune system. All of this process will happen without causing any damage to the surrounding tissues. 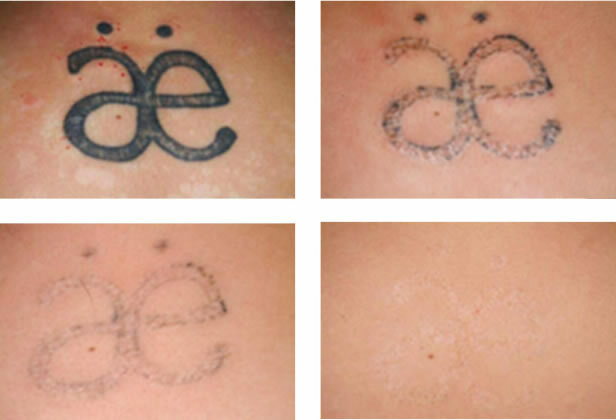 We offer to every client a FREE initial consultation where we can further discuss treatment plan and make sure you are a suitable candidate for laser tattoo removal treatment. 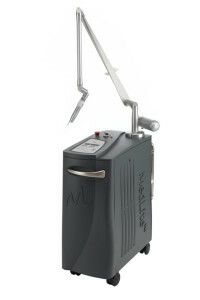 The Medlite C6 is a medical grade Q-switched laser that can be used for a variety of treatments, including tattoo removal. It can remove any colour tattoos without damaging the surrounding tissue. We use Zimmer Cooling System to minimize discomfort during treatment. It can reduce up to 80% discomfort during your laser tattoo removal session. We can also use an Ice Pack for the same purpose if that is your preference. Do you remove cosmetic tattoos? Most cosmetic tattoos are made of an iron-based ink that will not respond well to laser treatment, and will possibly make it worse. The recommended number of treatments will vary depending on area of the body and also on the body’s ability to detoxify the ink particles. It normally takes minimum of 6 sessions. Coloured tattoos will also take longer. Greens, yellows and florescent colours are the hardest colours to be removed. Treatment sessions can be done 6-8 weeks apart. It takes the body around that time to eliminate the ink, so treatments done any closer together would not be effective. Depending on the size of the tattoo, it can take from 10 minutes on a small tattoo up to 30 minutes on a very large tattoo with multiple different colours. It can be quite uncomfortable to some people, but it will all depend on each individual’s pain threshold. To minimise discomfort we use the Zimmer Cooling System and/ or Ice Packs (clients choice). Will treatment remove the tattoo completely? Or will it leave a scar? 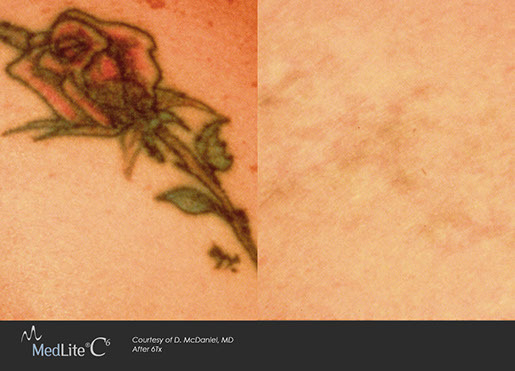 In the majority of cases the tattoo will be removed completely without leaving any marks or any scarring. Very rarely, scarring can occur. If post-care instructions are properly followed, the treatment should leave no scarring. Can you remove coloured tattoos? Can you remove only some parts of my tattoo? Yes, definitely. We can target specific areas on your tattoo in case you only want to remove some parts of it. Can pregnant women have tattoo removal treatment? No. Tattoo removal is not recommended on pregnant women as ink particles are shattered into blood system. If you have already started a tattoo removal course of treatments and fall pregnant, please advise us. We will suspend treatment until after the breastfeeding phase is finished then we can resume treatment without affecting the results. A white frost-like reaction is common after the treatment. That will fade in about 30 mins after treatment. Redness and mild swelling are also common reactions. They normally subside after a few hours. We offer a 15 minute FREE consultation for every client prior to commencing treatment. In the consultation we will discuss the treatment more in depth and answer any further questions you might have.